The Metamembrana interactive installation is the third episode of the Membrana project; the first two episodes, Protomembrana (2006) and Hipermembrana (2007), are both mechatronic performances. The audiovisual techniques used in Metamembrana are the culmination of a development process that created graphic and interactive solutions for the first two episodes. Metamembrana was produced by L’Anella Cultural, CCCB (Centre of Contemporary Culture Barcelona), the i2CAT foundation and the cities of Olot, Reus, Granollers, Lleida and Barcelona. When it opened, it was exhibited simultaneously through five exact replicas in each of these cities which were all linked by internet. The installation consists of a 16:3 format projection showing a single 12 metre image. In front of the screen are four interfaces: a face capture machine in a wooden hut, a mat concealing four on/off sensors, a microphone and Fembrana, an anthropomorphic figure with a joystick nose, an on/off sensor in the breast and an on/off position sensor in the hand. The installation aims to create means whereby the spectator becomes part of the work. To achieve this, a large part of the content of Metamembrana arose through social interaction based on the exchange of ideas and materials between individuals and organisations in each of the participating cities. The interfaces enable the users to browse through a hypertext made up of eight interactive micro-stories. These can be accessed through the panoramic landscape that functions as an index for the work. Five of these stories are interactive films and they arose from the social interaction mentioned above. Some reinterpret local traditions such as the epic battle between Blancs and Blaus (Whites and Blues) in Granollers, and the triumph of death performed by the traditional group Colla de Diables/ Ball de Diables from Reus. Others present local themes such as the Paradise Tree in Lleida, musicians in the Raval district of Barcelona or invent stories such as the Fable of Porcoboc from Olot. 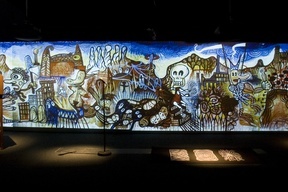 The landscape also enables access to other interactive devices such as Guiñol (Puppet Theatre) and Instrumento / Fembrana. When the user shouts into the opening of the wooden hut, s/he triggers the face capture device and activates the interactive Guiñol. The user’s face is immediately digitalised and becomes the face of a character on the screen. The spectator thus acquires grotesque ephemeral identities. Fembrana is designed as an online interactive instrument enabling the different exhibition centres to be linked, (when there are several), and it also enables spectators to interact in real time with Internet users. Stage design: Coral Senderos, Wahab Zeghlache, Victor San Segundo Mari, Álvaro Sosa, Roger Belles, Montse Arroni. Project coordinators: Anella Cultural: Josep Quintana; Lleida: Núria Marsal; Reus: Pilar Llaurador; Barcelona: Angela Martinez; Granollers: Glòria Gimenez; Olot: David Santeularia & Rosa Rebugent. Organisation: Espai Zero.1 d’Olot, Espai d’Arts de Roca Umbert Fabrica de les Arts de Granollers, Espai d’Art Cal Massó de Reus, Centre de Cultura Contemporània de Barcelona (CCCB), Institut Municiapl d’Acció Cultural (IMAC) de Lleida. ESCOLA D’ARTS D’OLOT: Salvador Capellà Sunyer, Narcís Garcia Torroella, Miquel Alari Gil, José Luís Jaén Castillo, Clara Pérez Bieto, Albert Comerma Bertran, Josep Subirana Bodro, Laura Algué Moreno, Alba Danés Boix, Zaida Casadevall Vidal, Víctor Guixà Saladrigas, Cristina Olivets Culubret, Núria Bartina Suñé, Sara Montroig Cruset, Chantale Heimo, Isaac Ballesté Martorell, Sergi Farrés Perarnau, Sergi Planagumà Pont, Joan Salvi José, Jaume Costa Pont, Pau Mateo Morros, Olga Galceran Flores, Joan Gol Rocasalva, Ruth Bernal Rodríguez. COLLES DE BLANCS I COLLES DE BLAUS & INSTITUT DE BATXILLERAT ARTÍSTIC CELESTÍ BELLERA GRANOLLERS: Sheila Balibrea, Victoria Cabezoz, Laura Capilla Ramirez, Anna Civera Ligero, Filipa Da Silva Vieira, Daniel De Izaguirre Fraile, Silvia De Riba Mayoral, Ramon Forns Canal, Daniel Garrido Payo, Sara Gramifiro Rua, Sergi Grau Carrion, Raquel Guirado Colomer, Andrea López Pamias, Daphne Malherbe, Diane Malherbe, Xènia Maresma Espejo, Jessica Medina Casquet, Juan Antonio Monao Riu, Mayum Omi, Carmen Palomo Batlle, Andrea Páramoc Do Santos, Xavier Pujadas Costafreda, Montse Plans Ventura, Raúl Ribas Porras, Mariona Rovira Tarabal, Patricia Sierra Miranda, Silvia Tallada Ytchart. BALL DE DIABLES DE REUS: Raquel Sardà Atienza, Maite Atienza Pollina, Ester Raduà Prous, David Sardà Atienza, Sara Padrell Sánchez, Joan Ramon Llort Subirats, Pere Arnau Ricart, Jordi Burillo Pujol, Jordi Casanovas Vinaixa, Cori Fortuny Alegret, Joan Porqueras Obré, Gerard Porqueras Balaguer, Marta Bros Fortuny, Marta Tévar Beunza, Sònia Girona Muntaner, Mònica Balsells Aran, Coia Casas Fuentes, Sara Mestre Casas, Maria Martí Raduà, Lluis Bros Ribes, Josep Mª Bros Ribes, Xavier Panisello Tortajada, Anton Morales Bújer, Fina Castan Pardo, Siscu Brunet Marti. AULA DE TEATRE DE LLEIDA: Xavier Carrasco martínez, Mireia Casado Huertas, Ricard Cuesta Macià, Oriol Esquerda Tosquella, Laura Farré Mercer, Yasmina Gisbert Latur, Maria del Mar Juvé, Laia Moraño Llop, Alba Nus Solé, Josep Romeu Font. Escola Municipal d’Expressió; Escola Pigment d’Olot; Mercè Ballespí Villagrasa & l´Aula de Teatre de Lleida; Tena Busquets & el Teatre Principal Olot; Carme Ortiz, Albert Ruscalleda & l’Escola d’arts d’Olot; la Fundació d’Estudis Superiors d’Olot; l’IMAC de Reus; Siscu Brunet & la Ball de Diables de Reus; Ana Estany; Irene Bosch & la Trifulca A.C.; Escola Superior de Disseny i D’ Art Llotja; Jordi & Toni Puig; en Serra & la Rosa Rebugent; Elda Catalina; Miguel Rubio; Anna Antúnez; Fortià Cases; Alvar Antúnez; Adelaida Antúnez; Begoña Egurbide. Pere Salabert. Hector López. Vanessa Vozzo & Malafestival. Stéphane Cagnot.